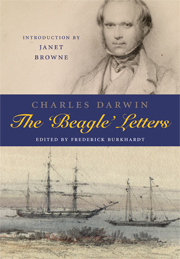 From Mauritius, most of the way home to England after years at sea, Darwin recalls some of the highlights of his journey in a letter to his sister Caroline. He and the entire crew are very homesick, and it shows — much of his letter is occupied with musings about the publication of his field notes, as well as Captain FitzRoy’s own account of the journey. As it is today, publishing in 1836 was a tricky prospect. We then proceeded to the Keeling Isds.— These are low lagoon Isds. about 500 miles from the coast of Sumatra.— I am very glad we called there, as it has been our only opportunity of seeing one of those wonderful productions of the Coral polypi.— The subject of Coral formation has for the last half year, been a point of particular interest to me. I hope to be able to put some of the facts in a more simple & connected point of view, than that in which they have hitherto been considered. The idea of a lagoon Island, 30 miles in diameter being based on a submarine crater of equal dimensions,2 has alway appeared to me a monstrous hypothesis. From the Keeling Id we came direct to this place. All which we have yet seen is very pleasing. The scenery cannot boast of the charms of Tahiti & still less of the grand luxuriance of Brazil; but yet it is a complete & very beautiful picture. But, there is no country which has now any attractions for us, without it is seen right astern, & the more distant & indistinct the better. We are all utterly home sick; I feel sure there is a wide difference between leaving one’s home to reside for five years in some foreign country, & in wandering for the same time. There is nothing, which I so much long for, as to see any spot & any object, which I have seen before & can say I will see again.— Our heads are giddy, with such a constant whirl. The Capt, continues to push along with a slack rein & an armed heel.— thank Heaven not an hour has lately been lost, or will again be lost. We shall leave this Isld. in 6 days time; if there is any opportunity, I will write from the C. of Good Hope & that letter possibly may be the last you will receive, before you see me arrive, converted into an ancient, brown-colored Gentleman. The minute the Ship drops her anchor in the mud of old England, I will start for Shrewsbury.— I trust we shall find letters at the Cape; but I have many fears; the date of the last letter I received was 13 months ago: This is a grievous period, to be entirely ignorant, about all, one care’s most for.—It is probable we shall arrive early in September; you must recollect the possibility of my not having received letters for 18 months, so retell me any thing important; if I do not come by the 14th of Septemb. write again to Plymouth post-office. So that when, I start for home—I may travel with a certain mind. God bless you all. May you be well & happy. Forgive such a letter; I am sure, you would sooner have it, than nothing.— So once again farewell to you all.— give my most affectionate love to my Father & all | My dearest Caroline | Your affectionate brother | Chas. Darwin.